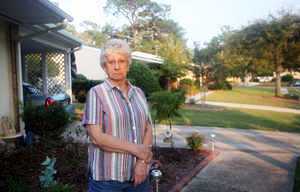 Until recently, Monair Hamilton of Myrtle Beach never questioned what her homeowners association did with her hard-earned money. After all, her grass got mowed regularly and her monthly dues covered her home insurance costs. That was before an 11-page letter from the neighborhood's property manager circulated that brought board practices into question, spurred a lawsuit and ultimately led homeowners to oust the entire board last month. "I thought that things were fine," said Hamilton, a resident of the 800-home neighborhood Seagate Village for more than three years. "Now I'm awake and aware." Seagate Village's spat might sound familiar because similar conflicts are flaring up along the Grand Strand and across the United States. The number of homeowners associations is on the rise - the Community Associations Institute says there were 286,000 of them in 2006 with control over $41 billion in operating revenue - double what fast-food giant McDonald's makes in a year. Pat James talks about the Seagate Village property owners association on Wednesday. Along the Grand Strand and in Brunswick County, N.C., almost all of the developments built since 2000 have homeowners associations attached, said Steven Neeves with the Coastal Carolinas Association of Realtors. As the number of residents in these associations grow, so does the number of disputes and the need for regulation over associations' governing boards, critics say. Most homeowners associations are nonprofit corporations responsible for maintaining a neighborhood's common areas, such as pools, tennis courts, parks and sometimes roads. Some also contract with companies to provide services, including insurance, pest control and home repairs to all homes in the neighborhood or complex. Residents pay monthly dues for these services that range from less than $25 to more than $500, and they must follow the association's covenants, conditions and restrictions included with the deed when they purchase the home. In most cases, residents get a good deal for their monthly dues, said local real estate experts. "The pluses are it does give you some regulations and things to make sure your community functions and runs properly and is not negatively impacted by influences affecting property value," said Tom Maeser, president of the Fortune Academy of Real Estate. "The goal is to maintain and enhance property values and keep the neighborhood in a good condition, and typically that works pretty well." Seagate Village resident Pat James said she likes the rules that keep home appearances and colors consistent. Without them, "anybody could do anything they want to, and I don't want a purple house next door," she said. The rules and penalties vary by neighborhood. The Olde Harbour Homeowners Association in Little River recently sparred with some residents over the colors of their homes. In July, it sent a letter to a resident with a pink home saying the color did not fit with the community and needed to be changed. About 22 other residents got similar letters. In communities such as Fairway Oaks in Cherry Grove, homeowners have been asked to remove American flags flying in their yards or face fines. Others regulate the type of flagpole that can be used, whether residents can use clotheslines or put up holiday decorations. The problem with homeowners associations is that there is little recourse when they stray from their duties because no regulatory agency oversees them, critics say. "Homeowners living in mandatory homeowners associations are more or less unprotected by the law," said Jan Bergemann, founder of Cyber Citizens for Justice, a Florida-based group that advocates stricter laws against homeowners associations. "If you're an owner and let's say you request financials, if they don't give them to you even if required by law to do so, what are you going to do?" All residents can do to fight back is file costly lawsuits, he said, and even then residents pay the association's legal fees through their dues. "Win or lose it's always the owner who pays because in a way you sue yourself," he said. The lawsuit against Seagate Village, filed by Seagate property owner William Miller III, claimed the board did a number of things wrong - such as canceling contracts with the landscaper, insurance carrier and management agent; hiring unlicensed service providers; and failing to comply with its own bylaws. The lawsuit also called for a fair election to remove the board. "The thing that sent people over the edge was when they canceled the insurance policy mid-policy and replaced it with what they said was an equivalent policy, which was not the case," said Miller's lawyer Robert Moran Jr. The insurance coverage the board chose was not the same, but better, according to a letter from the board of directors to residents. Because there have been so few insurance claims, the board thought it could afford to get a cheaper policy with a higher deductible and put its monthly savings into a reserve fund. Now that residents have voted out the old board and a new board is in place, Miller will likely dismiss the lawsuit, Moran said. "The law gives directors of not-for-profits a lot of protections, and you've got to do something really bad in order for you to be legally responsible," he said. "Unless we can find that this board has somehow enriched themselves or disappeared some money then they're probably OK."
Disputes such as these are not uncommon. At North Myrtle Beach Golf and Tennis Resort, for example, at least one resident is fuming over a $13,000 special assessment charged this year to each unit to put vinyl siding on the complex's eight buildings. Richard Roitmayer, who has owned the condo with his mother since 1991, refused to pay at first because he thought the association could get the job done much cheaper than the $2.4 million the association collected. Then the homeowners association put a lien on his condo and threatened to foreclose, which the state's Horizontal Property Act allows as a way for associations to collect unpaid dues and assessments. Roitmayer paid so the lien would be removed. "Does this mean my civil rights get thrown out the door when I become a member of a homeowners association?" he said. "I think this is crazy. I have to sue to get a percentage of my $13,000 back." Leon Gibbs, president of the complex's association, said that owners had the chance to vote on the assessment at a March meeting, and a majority of owners supported it. They got a report from an architect who determined that the deteriorating wooden buildings had leaks, mold and mildew problems. The money will go toward gutting the rotting wood, putting in new insulation, installing vinyl siding and bringing the buildings up to code, Gibbs said. "We, the board, could be sued by members for not taking care of the buildings," he said. "The board has the final authority and fiduciary responsibility to improve the common elements of the property. You'll find that as a common theme out of almost all of the homeowners associations in America." Groups such as Bergemann's Cyber Citizens for Justice and AARP are advocating for stronger controls on homeowners associations. AARP has developed a 10-point homeowners' bill of rights it encourages all states to adopt to protect seniors and other homeowners against unruly associations. It includes security against foreclosure, ways to resolve disputes without litigation and ensuring that people are told about all the rules and charges. Legislative reform is one of Cyber Citizen's main objectives. Until federal or state regulatory bodies are in place, existing laws will continue to have little to no impact, Bergemann said. "There are laws in existence but nobody has to care because they know if they break it, nothing will happen," Bergemann said.